Alex Van Etten of Maine Coast Co. carries a 100-pound crate at the company's York facility, which has a capacity for 160,000 pounds of live lobsters and provides rapid-ship delivery worldwide through Logan Airport in Boston. YORK, Maine — The most recent round of U.S. trade talks with China seem to be signaling an easing off of tariffs imposed last year, perhaps as soon as this month. 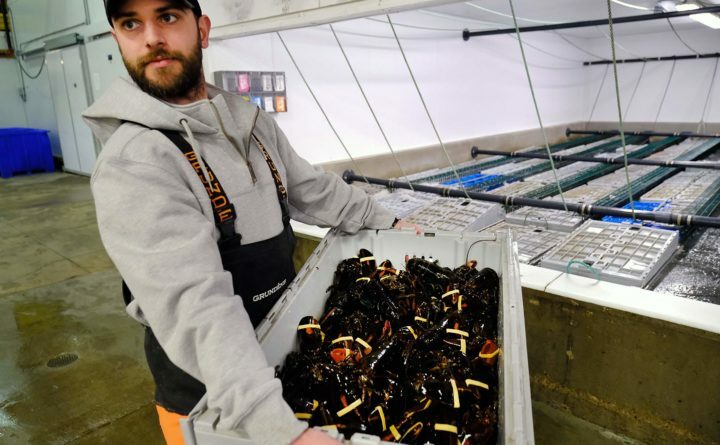 That would be good news for Tom Adams, owner of lobster wholesale business Maine Coast Company. Since “July 6,” he says, effortlessly recalling the exact date, a 25 percent tariff has been imposed on all lobster exported from the United States to China, as trade tensions between the two countries escalated. At the time, trade with Chinese companies comprised about 20 percent of all company revenue and business was growing, he said. “The first couple of days we were stunned. We were very vested in the China business,” he said. Company officials had been monitoring trade talks in the early months of 2018, he said, but there was no sign that lobster would be included in the tariffs. Almost immediately afterward, trade with Chinese companies evaporated, resulting ultimately in an 80 percent drop in business to the country. That game plan has proven highly successful if extremely stressful, he said, and has kept the company on an even keel. In 2017, he said, the company’s revenue was $56.4 million; Maine Coast ended 2018 with $57 million in revenue, despite the loss of China trade for the last six months of the year. But Adams is the first to say the transition required a nimble workforce that worked hard to find new business. A key part of the game plan was to grow the market in other Asian countries including Singapore, Malaysia, Vietnam, Hong Kong and Korea. The company had just hired two salespeople, one fluent in Mandarin and the other in Cantonese, which was helpful. “We knew we were being shut out of China, so we asked, where can we direct our sales efforts? “It was hard for them, because they were planning to use their skills and expertise in mainland China. All of a sudden we are saying, ‘Whoa, we need you to focus on here and here and here instead,’” said Adams. The effort worked. The company has almost doubled its business with Singapore, Malaysia and Vietnam alone. Exactly when that business with China will come back remains uncertain. In early March, it appeared fairly certain a trade deal between the two countries could lift most or all of the tariffs. Yet several weeks later, President Trump said the tariffs could stay in place indefinitely.